Written by gamer one on October 16th, 2015 February 15th, 2017 . Fun Fact: A 50th Anniversary of the Game was recently Kickstarted in August 2015. Overall Thought: A reasonably fun game that is entertaining to play every now and again. 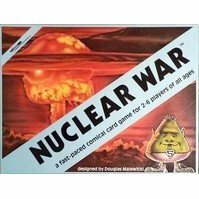 The Rambling Review: Nuclear War is a game first created fifty years ago to show the humorous side of nuclear warfare. While not quite Fallout levels of humor, Nuclear War’s cards managed to elicit quite a few chuckles at our table, even when I mysteriously lost half my population. Nuclear War’s game play enjoyment really hinges on having the right group of friends at the table, because, at its core, it is a social game. The game has three components, population cards, action cards, and a spinner card. Yes, there is a spinner. The population cards determine your country’s starting population. We actually role-played stereotypes of real countries, it did enhance the enjoyment. The action cards include nuclear delivery systems, nuclear armaments propaganda cards, defense cards, and top secret cards. The spinner acts as a randomizer to make your nuclear warheads more powerful, less powerful, or the neutral. The spinner includes a dice table should you want to change it out for two die. The goal is simple, be the last country with population. The rules are pretty simple and after reading the front and back rule sheet a few times our table got them down and only had to consult the rules a couple of times for clarification. The mechanics of playing the cards was a little wonky at first and required some thinking to play. Twice I failed to load a nuclear warhead onto my delivery system, but it wasn’t necessarily the game’s fault. The way the cards were played required a bit more thought than I was accustomed. It didn’t seem to affect the others at the table, so this is a minor complaint at best. There is an ability to show cards as deterrence, but we only used it a couple of times. I suspect because it caused a wrinkle in how the cards were played which we were not accustomed. We played a couple of games in forty-five minutes and in all honesty in a small setting your game will last 15-30 minutes. It supports six people, but we did not try that amount. We don’t see any reason why more people would be less fun. Six people would probably led to slightly longer games and more ebbs and flows between war and peace. Ultimately the fun of this game will come down to your gaming group. If your group does not mind a lighthearted light strategy game with a fairly fun randomizer, then this game is right up your alley. However, if you play this game with someone who is ultra competitive and gets upset if their perfect strategy does not lead to victory, then maybe you will want a different game. The Bottom Line: At $40 it is hard to say there is enough fun to justify a blind purchase, but anything at $25 or less it is a steal. At $40, if your group likes a fun social/light strategy game to play in between more serious games, then we would recommend it. Based on our research this game is constantly voted in the top 100 board games and it is easy to see why viagra per nachnahme kaufen.